And yes that is a genuine 431G. As you guys know it is THE holy grale of slant needle machines! Re: Show us your Singers! WOW! K - that 431G is so sweet! No singer, here is my latest, a Janome touchscreen. the ipod of SM's. more options than i can handle, to be quite frank. sorry for the dim light, crappy camera. You guys know what they say..."Once you go Vintage..."
AND one for the ladies!!! I'll put a collection shot together later. Gonna have to run down to the bank to get the nice ones out of my safety deposit. I also have to pick up some powerful narcotics and mail my Pararescue Association dues. 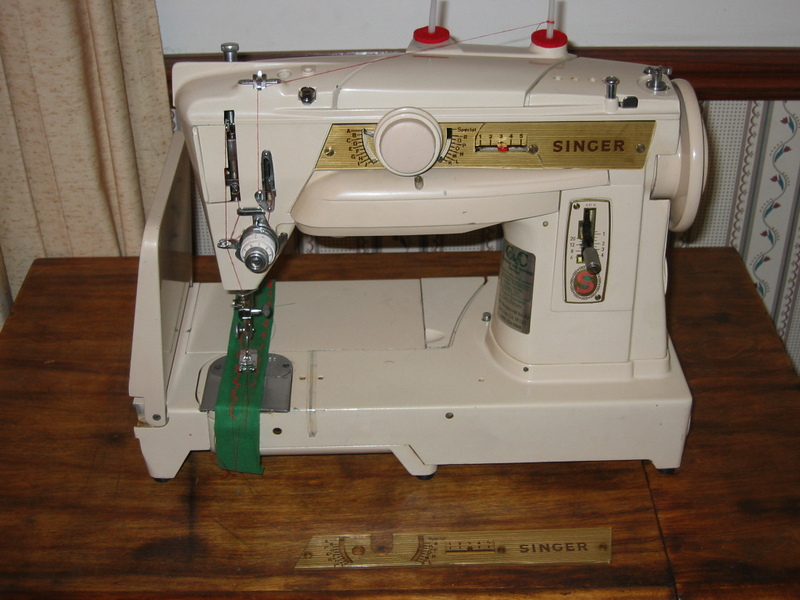 I hate sewing machines when in the Navy at sima thats a place on a Naval base that does ship repairs I worked in the sail loft we would make 50ft long boat cover,flight deck net's,lube oil bags these little bags the dam USS Enterprise wanted 600 of those dam things we used these WW2 era Singer sewing machine's.Thank god for the box and cross singer for the flight deck net's you would weave them together and put the wire pendents through them and then put the lupe of the net to be sewed we would press the foot button and the machine would sew a box and cross design that save you from eye balling it.We even made cover's for furniture and wind screens with the ships name on them and cover's for computer's any thing a ship wanted after they put in a work order for.When I got order's for another unit happy day's were here again.It was one boring job.Don't care to see another sewing machine.I don't think I ever told you forum member's this story. I guess some poor sailor's still got to work in the sail loft. my everyday beater ... 1953 Singer with cabinet .... AND, the Queen .... my Singer 115 born in 1915. It's a LE of 2500. My grail. polaco23 wrote: sweet toys Ken! This is one I'll never get rid of. A bit out of date, but if it works, why replace it? 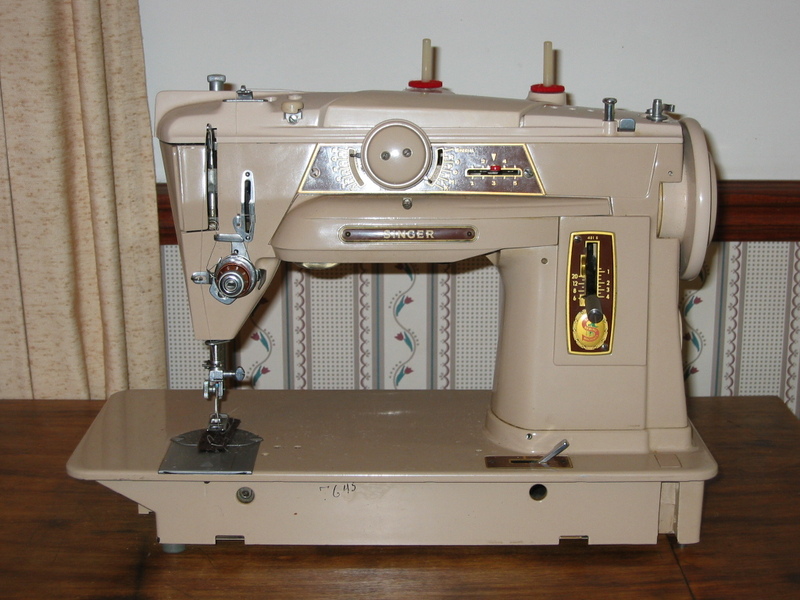 During WWII, Singer suspended sewing machine production to take on government contracts for weapons manufacturing. Factories in the US supplied Americans with Norden bomb sights, M1 Garand rifles and M1911 pistols while factories in Germany provided their armed forces with weapons. Original and correct Singer pistols are highly desired by collectors and when sold, bring significantly higher prices than more common 1911A1 pistols. The Krause Publications 2002 “Standard Catalog of Firearms Price Guide” lists (Original) Singer pistols in excellent condition (96%-98%) at $25,000, in very good condition (92%-95%) at $18,000, in good condition (85%-95%) at $12,000, in fair condition (65%-85%) at $7,000, and in poor condition (60%or less) at $3,500. 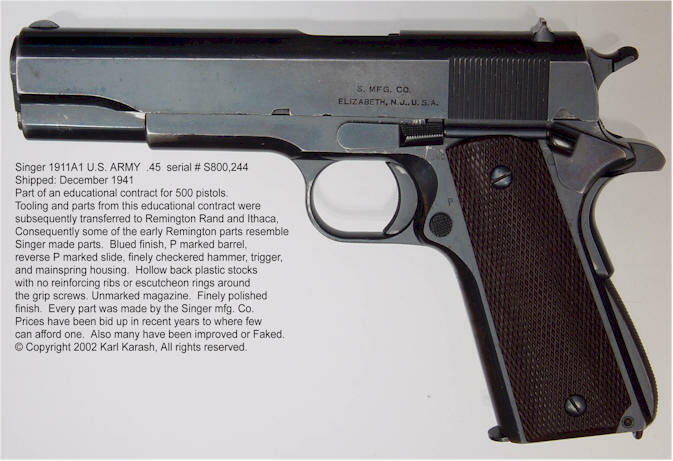 Singer pistols are one of the most copied/forged M1911-A1s.